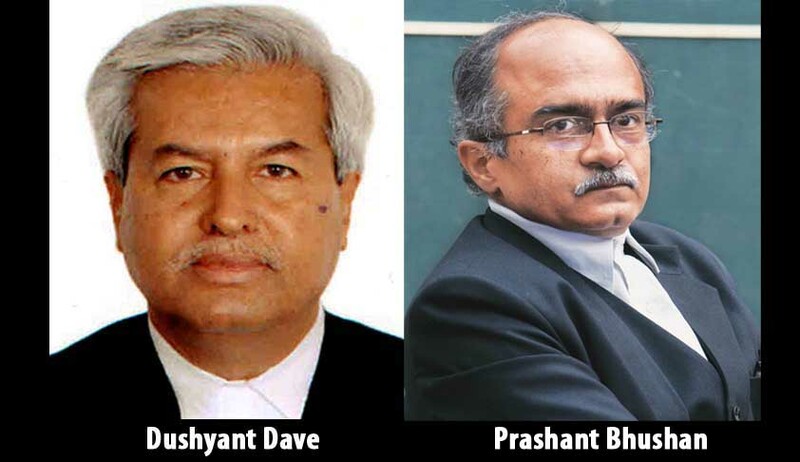 Former Supreme Court Bar Association(SCBA) President Dushyant Dave has taken to task the members of present executive committee while accusing them of attempting to “condemn him and Prashant Bhushan personally” for fighting a case which has demanded probe into the allegations against some senior most judges of top court, lawyers and politicians. Expressing disappointment, in a strongly worded letter addressing to the committee on Saturday, Dave said an emergency meeting was called by the executive committee members on Friday afternoon to “condemn both the lawyers for their appearance in the Writ Petition Criminal No 30/2017: Dangwimsai Pul” but the attempt was failed after majority of the members opposed the move. However, the Executive Committee in the late evening clarified in a statement that no such resolution was passed in the meeting and Dave has been either misinformed or he has not verified the facts before taking it to personally. The SCBA, however, clarified saying “It is either a result of incorrect information or based upon presumptive imagination with the objective of pre-empting Executive Committee from free and independent discussions to arrive at appropriate decisions concerning the interests of Supreme Court Bar and Judiciary. LiveLaw has access to both Dave’s letter as well as SCBA executive committee’s statement. Last month, former Arunachal Chief Minister Kalikho Pul’s wife had written a letter to Chief Justice of India (CJI) to initiate investigation against some senior judges of top court, lawyers and politicians as alleged by her late husband before committing suicide in a 60-page note in August last year. Few days later, CJI had passed and order and later listed the matter for hearing in open court after converting the same to a writ petition. Dave, who appeared for the wife withdrew the letter saying that they never wanted any judicial order but wanted an administrative order. Issuing a statement, signed by President, Vice President and Secretary, SCBA said, “there was no discussion of condemning anyone and there was no reference to Mr Prashant Bhushan. The discussion took place on several urgent matters including the fact that when matter of Kalikho Pul was listed, the counsel decided not to argue the matter and to withdraw the same. Mention of some retired Supreme Court Judge had also been made by Mr Dave in Court but the name had not been revealed to the Hon’ble Court.